E. Michael Jones, editor of Culture Wars, joins the Truth Jihad for some spirited interfaith dialogue around his forthcoming article “Catholics and the Jew Taboo.” In that article, whose title references Charles Bausman’s “It’s Time to Drop the Jew Taboo,” Jones argues that Catholics and Jews have been fighting “culture wars” over such issues as gay marriage, but that Catholics have been handicapped by the taboo against naming their opponents. Is E. Michael Jones articulating what should be a legitimate, mainstream Catholic position? I don’t know; that’s up to Catholics to decide. But since he argues his position in a clear, reasonable, erudite, well-sourced way, I am strongly opposed to those who are trying to silence him. Whatever the merits of his positions—and I forthrightly disagree with some of them in this interview—E. 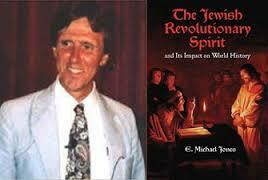 Michael Jones is an important Catholic voice. Anyone who wishes to refute his arguments is welcome to contact me by way of TruthJihad.com (or the comments section here) and I will offer you airtime to respond. This show was broadcast on April 4th, 2018. This entry was posted on Monday, April 2nd, 2018 at 7:38 pm	and is filed under Censorship-Propaganda, Education, Freedom, Human Rights, Kevin Barrett, News, Protest, Spirit. You can follow any responses to this entry through the RSS 2.0 feed.